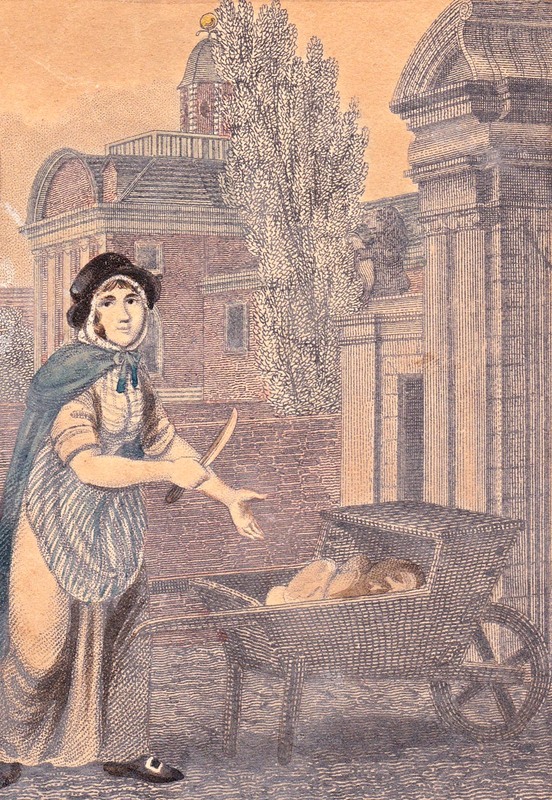 In a long letter dated Thursday 18th – Saturday 20th April 1811 Jane Austen wrote to her sister Cassandra about her activities in London. She was staying with her brother Henry and his wife Eliza in their house at 64, Sloane Street in Knightsbridge, which at the time was a separate village from London. 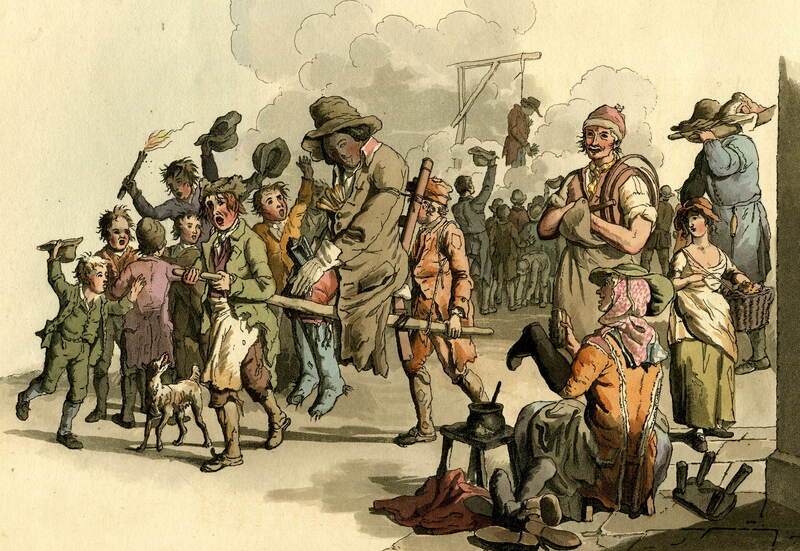 From the way Jane writes about walki ng ‘into’ London it was clear that this separation was felt by residents. The house in Sloane Street is still there, although at first glance it is unrecognisable as the one where Jane stayed. In 1897 another floor was added and the whole house refaced, but embedded inside is the original house, built in 1780. It is even possible to see the outer bay of the octagonal room where Eliza held a party on 25 April 1811 – all you need to do is walk a little way down Hans Street and look back at the rear of the house. In the photograph the house is covered in scaffolding and undergoing yet more changes. Knightsbridge village, and that section of the Bath road, are named for the medieval bridge over the Westbourne River, one of the ‘lost’ rivers of London which is not lost at all, but still runs under the streets to the Thames. It descends from Hampstead Heath and crossed the area that is now Kensington Palace Gardens and Hyde Park before meeting the Bath road. In 1730 it was dammed to form the Serpentine in Hyde Park and the Long Water in Kensington Palace Gardens. The village straggled along the highway with Hyde Park and the palace grounds to the north, and market gardens to the south. Brompton Road cut notheastwards from the little village of Brompton and the new, planned, Sloane Street meets the older, more irregular road at Knightsbridge at the point where there was a watch house and the village pound for straying livestock. 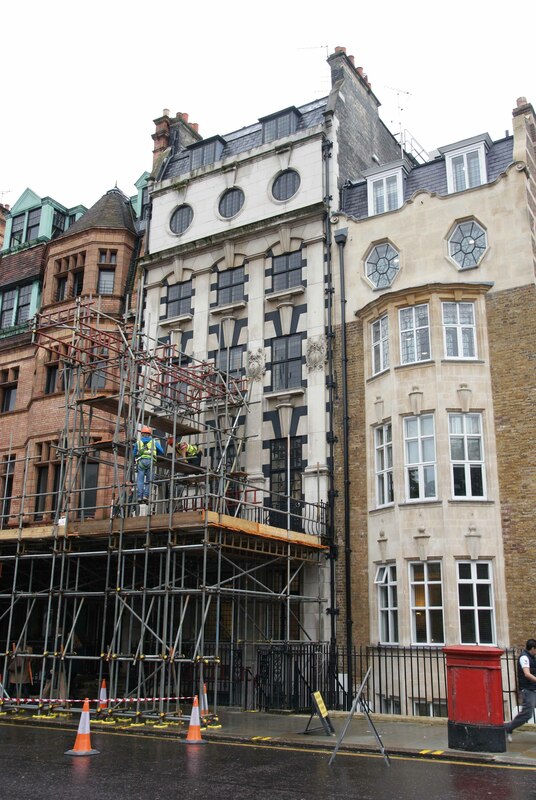 All along Knightsbridge was a scatter of substantial houses, inns and cottages. There was a cavalry barracks on the northern edge, with access to the park, and an infantry barracks on the southern side. 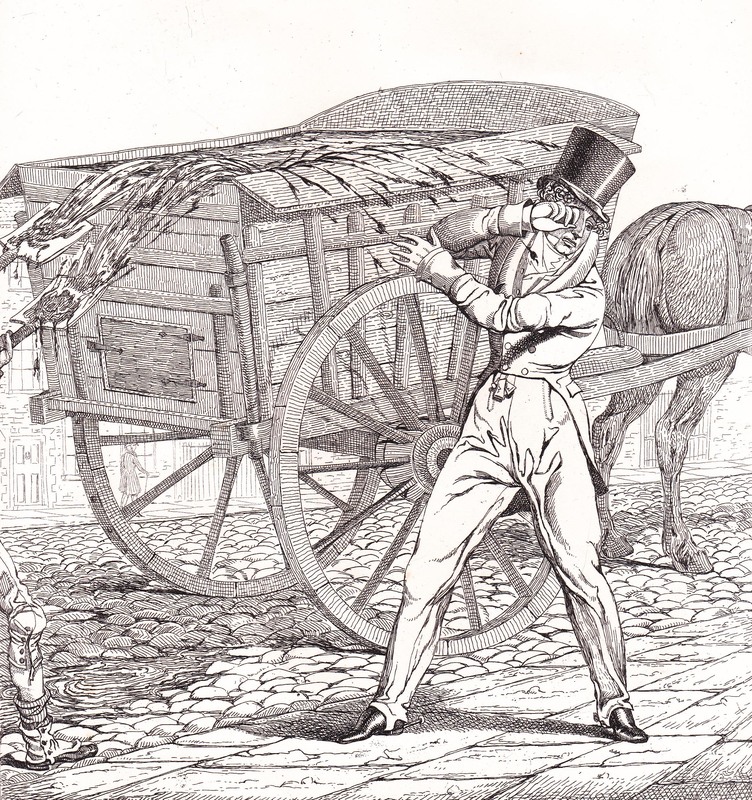 In her letter Jane describes two expeditions on foot into London. To begin she would have had a stroll of about three quarters of a mile from Henry’s house to Knightsbridge. 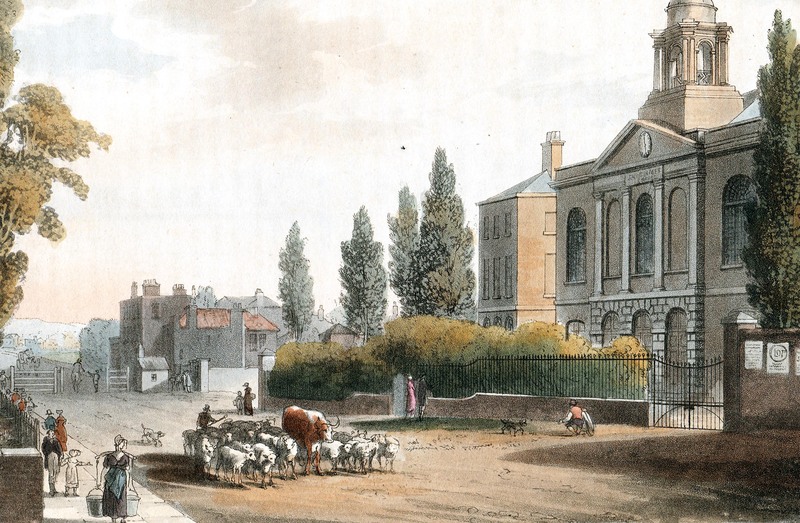 Sloane Street was built up with houses all along the western edge with the remains of market gardens to the east, although Cadogan Place was being laid out and a few terraces were beginning to appear on the eastern edge. Once she reached Knightsbridge she would then have turned right to ‘walk into London’ which she reached at the Hyde Park turnpike gate, another three quarters of a mile. There is nothing she would have recognised in the scene today. Sloane Street was rebuilt, or, in many cases, refaced, in the late 19th century and the inns have all either disappeared or have been replaced by Victorian buildings on the same sites. The cavalry barracks is still there, but rebuilt twice, most recently to a design by Sir Basil Spence that includes a tower block regularly voted one of the eyesores of London. Her sister-in-law Eliza seems to have been a rather nervous carriage passenger, so she would probably have been terrified by the volume of traffic at Hyde Park Corner today. 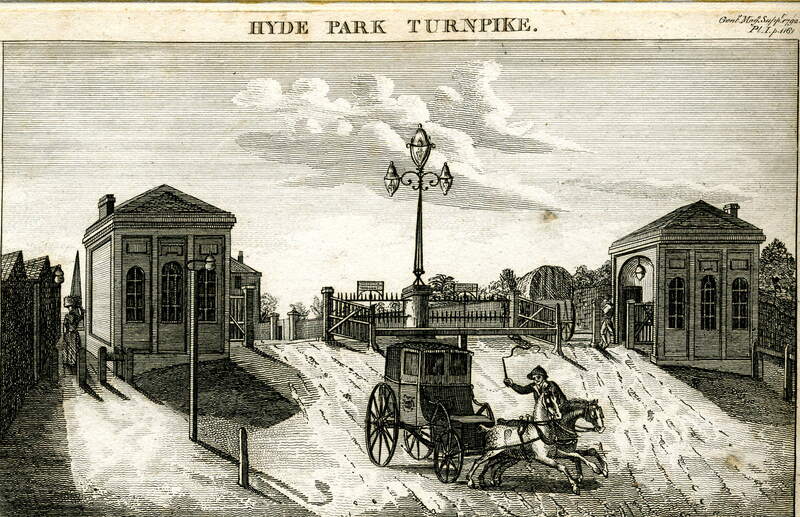 On the 25th April Jane wrote home about an incident at the turnpike: ‘The Horses actually gibbed on this side of Hyde Park Gate – a load of fresh gravel made it a formidable Hill to them, & they refused the collar; – I believe there was a sore shoulder to irritate. – Eliza was fightened, & we got out – & were detained in the Even[ing] air several minutes.” She blames this for the cold that Eliza had contracted, not realising that Eliza probably caught the same cold Jane was complaining about suffering earlier. The print above shows the turnpike gate looking towards Piccadilly. On the right is a watch house and on the left, just out of the picture, was a weighing house. 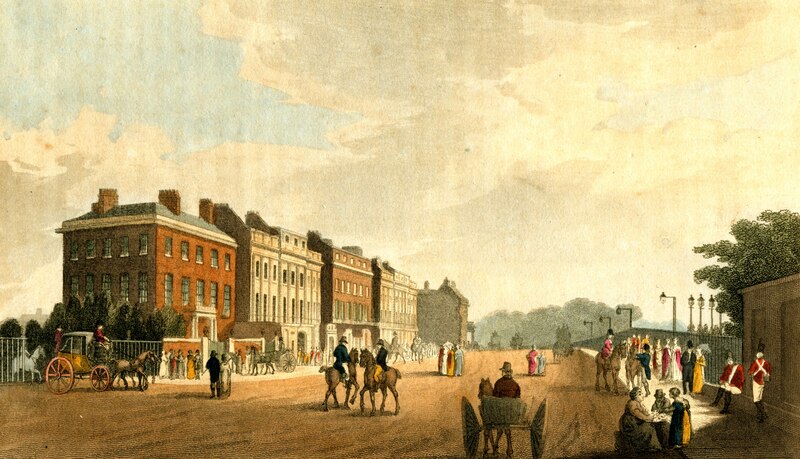 These d ays the Lanesborough Hotel occupies the old St George’s Hospital on the corner of Knightsbridge and Grosvenor Place and just behind that was the location of the famous Tattersall’s auction ring (1766-1865 when it moved to Newmarket). 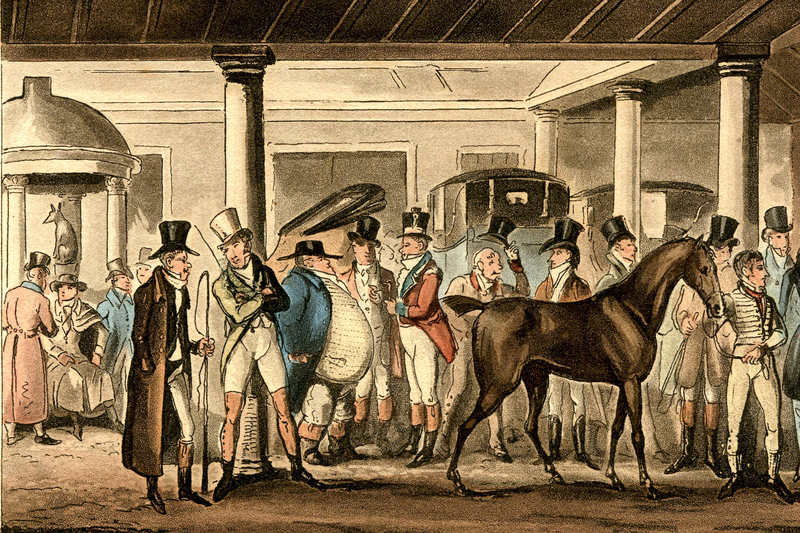 The print shows the central yard with an auction for a horse in progress. Carriages were also sold and some can be seen at the back. Now Hyde Park Corner is dominated by Apsley House, known as Number One London because it is the first house you came to once you were through the gates. The print from Ackermann’s Repository below shows it before the work on the houses to the left created Wellington’s impressive residence. On the right is the wall surrounding Green Park and Piccadilly stretches ahead of us. 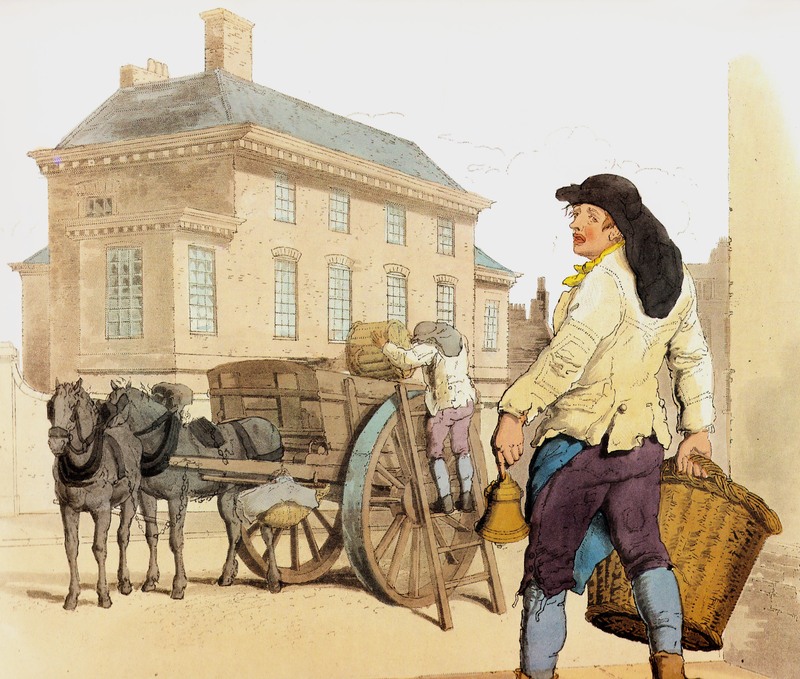 You can follow Jane’s walks into London in Walking Jane Austen’s London. Walk One takes you to Henry’s two houses in the area, then up to Hyde Park Corner and across the park to Kensington Palace. The site of Grafton House is visited in Walk Two. 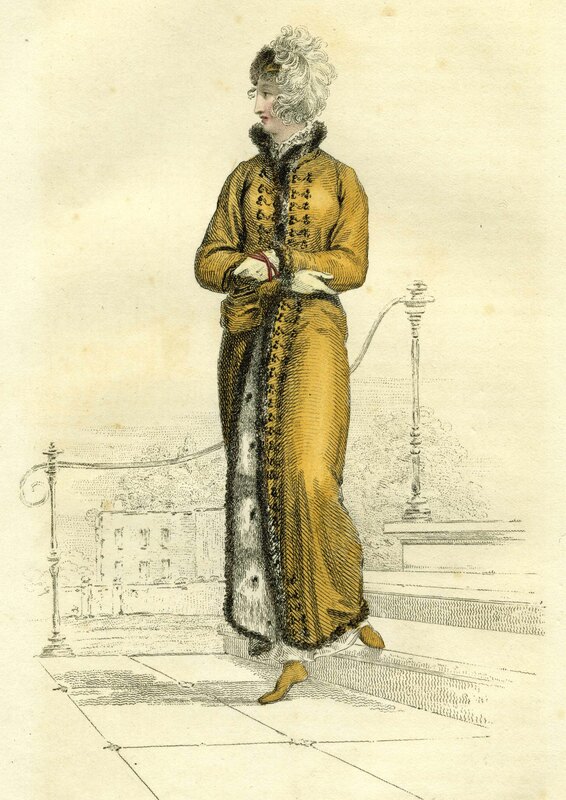 The Walking Dress is from a plate in Ackermann’s Repository for November 1811. 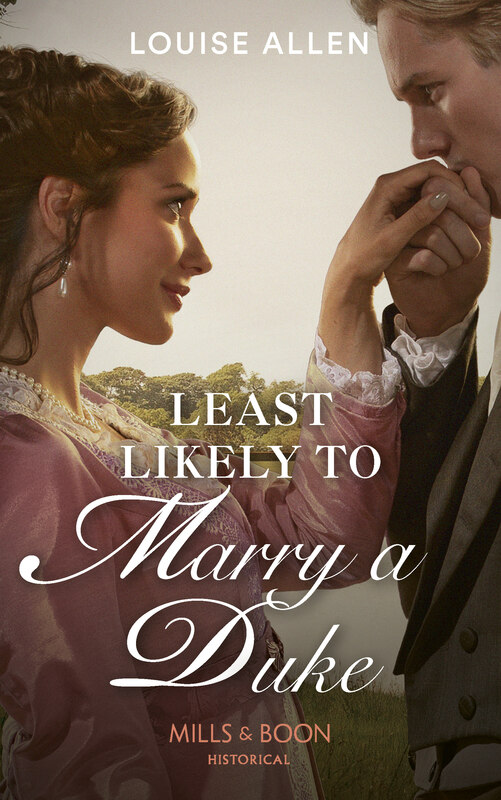 It is just right for fashion-conscious Eliza, but probably rather smart for Jane!